The stream of retreating British troops, tired and disheartened, were completely intermingled with one another and villagers. The Australians were the only ones in sight moving forward. Half eaten meals on cottage tables showed how hurriedly the people had left. The artillery of the AIF 4th Division which just three days earlier been in Flanders arrived by forced march and took up positions to cover the infantry. 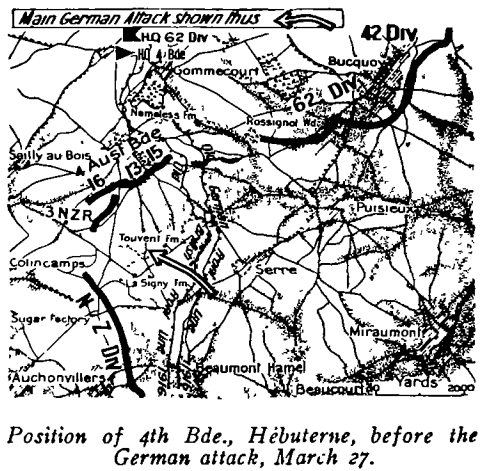 By nightfall orders were received to probe forward and to secure the village of Hebuterne which in turn was be probed by forward German patrols and my midnight the 13th Brigade had formed a defensive line through the village. However orders were received that the AIF 4th Division had to urgently march to a new destination south and towards Albert, and the 12th & 13th Brigades who had just reached their billets had to set off on a night march, accompanied by the sound of planes bombing and machine-guns rattling off to their left. Leaving the 4th Brigade at Hebuterne the column moved through almost empty villages, reaching their destination in the once familiar countryside between Warloy and Albert by dawn. The two Brigades of Gen. MacLagen’s 4th Division, plus the three of Gen. Monash’s 3rd Division would come under the command of General Congreve’s VII Corps and be tasked to deploy in a line across the German Army that had broken through his line between Albert and Bray, and now heading towards Amiens between the Ancre and the Somme. The Australians were now the most southerly of the British Third Army and given the task to protect its right flank. If the Germans were not stopped at about the line of the old French defences of 1914/15 to the east of Amiens then the German Army would be free to turn northwards behind the line of the British Third Army and southwards across the Somme and behind the Fifth Army.